Gibbet Hill townland is named after a small knoll situated about one kilometre west of Waterford City centre. This small hill can be located at the entrance to the Sherlock Walk housing estate, inside the city limits. 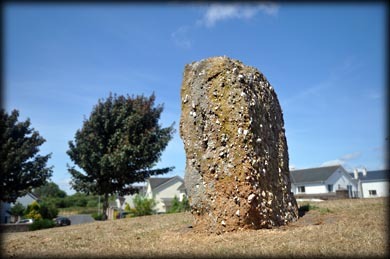 The 1.4 metre high clonglomerate stone is orientated north-south. From the north it looks like a rectangular block, roughly 0.6 metres wide and is about 1 metre in length. 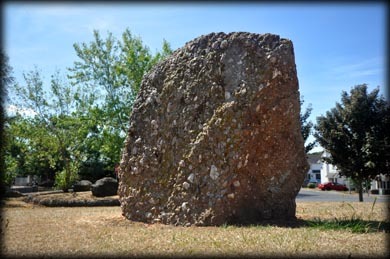 As you enter the estate the stone is on your right hand side, ignore the decorative boulders lying on the west side of the road. Worth a look if you are in the vicinity, but don't go out of your way. Situated: Heading south across Rice bridge, go straight through the traffic lights along Bridge Street (R686). Keep to your right at the fork. At the next crossroads take a right onto Gracedieu Road. After about 1 kilometre turn left. Sherlock Walk is the next road on your right. Discovery Map 75 S 5881 1291. Last visit July 2018.